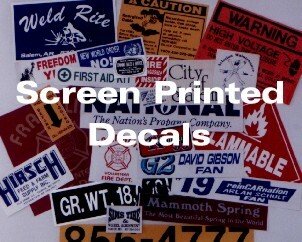 Screen Printed Decals made with custom logos and artwork are economic in larger quantities. Screen process printing is sometimes called "silk screen." We use the highest quality screen ink. We print on Vinyl and Polyester self-adhesive decal material. Our Screen Printed Decals are used on products for identification and safety labels as well as on windows and vehicles for Promotion and advertisement. There are hundreds of screen print decal styles with an endless variety of symbols, colors and sizes. All we need is a fax showing what you want, and we'll make a scale drawing and fax it back to you usually within 4 hours. We print with vinyl inks on different types of vinyl decal material. Economy Vinyl is rated 5 years outdoors. This 3 mil calendered product can be put onto surfaces without application tape. Many colors available. Premium Vinyl is rated 7 years outdoors. This 2 mil cast product should have application tape if it is over 4" x 4" size. Many colors available. 3M Reflective Scotchlite Vinyl is rated 7 years outdoors. This extra thick product can be put onto surfaces without application tape. A few colors available. Silver Polyester (reflective) and Clear Polyester are also available. All our self-adhesive vinyls should be applied in above 58 degrees fahrenheit temperature.